These wary and powerful birds can spear fish or catch them by using their bill like a scissors. Their habitat is freshwater areas and salt water marshes. The White Herons of Florida are an all white version of the Great Blue Heron, not a separate species. So with this plan you can make either version. Patterns drawn FULL SIZE. Projects stand approximately 40"-44" high after the 36" legs are pushed into the ground. 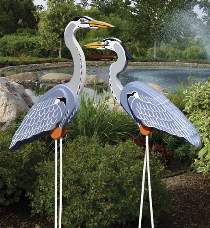 Order two eyes and two fiberglass rods for each bird separately below.